The Port of Longview had been planning to build a new grain export facility, however years went by and it was never built. There was a three year period following the bid of the job, where for different reasons, the project never took off. Years passed and in 2007, a contract was finally awarded that included demolishing the existing facility and driving the test piles. The rebidding of the in-water construction happened in 2009 and was awarded to the same contractor responsible for the demolition in 2007. This job included 36″ diameter steel piles, which were supporting four concrete platforms. 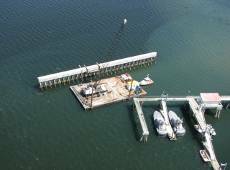 There were 18″ diameter steel batter piles supporting eight concrete breasting dolphins, as well as two concrete mooring dolphins supported by 24″ diameter steel batter piles. 18″ diameter steel batter piles supported the steel trestles, which connected the dolphins and platforms. Because of the water depth and various geologic conditions, the majority of the steel pile was between 100′ and 170′. The Berth 9 Grain Export Facility contractor was in charge of procuring the custom fasteners required for the project. Portland Bolt has a long-lived relationship with this contractor, so they knew exactly where to go for their fastener needs. Since the majority of the bolts were hot-dip galvanized and all of the materials needed to be 100% domestic, Portland Bolt manufactured bolts for this job every step of the way. Although there were many different configurations and grades of fasteners required, the parts that stood out the most were numerous headed anchor bolts, such as 1-1/2″ diameter and 1-3/4″ diameter F1554 Grade 105 heavy hex head bolts ranging from 18″ in length to 50″ in length, as well as rods with threads on each end reaching lengths in excess of 16 feet. Portland Bolt started manufacturing custom bolts for this project in November of 2009 and continued until the completion of the job in July of 2010.